NFLPA State Of The Union: "Prepare For The Worst, Even Though You're Hoping For The Best." Here’s the summary: We’re no closer to a deal. The NFLPA wants to play football next year, and is sorry for the impact these negotiations are having on fans. Their stance on key issues like the 18-game season hasn’t changed. But, the NFLPA’s leadership is extremely united and seems pretty confident. 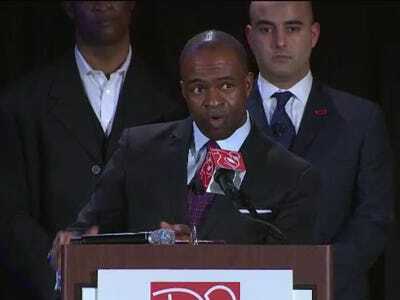 LIVE BLOG FROM THE PRESS CONFERENCE: NFLPA Assistant Executive Director of External Affairs George Atallah has taken the stage for the NFLPA’s annual State of the Union address (streaming live here). NFLPA Executive Director DeMaurice Smith says “we make it a point to not negotiate in the press.” But there have been plenty of discussions. Smith doesn’t think it’s a good idea to get our hopes up for his meeting with Roger Goodell on Saturday. Smith brings up how negatively a lockout would affect Indianapolis, the prospective host of next year’s Super Bowl. Smith responds to Jeff Pash’s claims that the current CBA is one-sided by saying that he guesses there’s some disagreement. Smith says every economic indicator points to huge growth for the NFL, and that favours the players in negotiations. Asked whether the March 4th deadline is influential, or if games will have to be canceled to get something done, Smith calls a potential lockout “irresponsible” for its impact on the fans. Smith calls his relationship with Goodell “great.” But won’t discuss his relationships with other owners. Smith very engaging with the media. The NFLPA still hasn’t received the financial information it wants. Smith says his interpretation is that the franchise tag goes out the window if there’s a lockout. Mawae wasn’t happy with Antonio Cromartie’s comments, but says he’s still a valued part of the “family’ and will be treated as such. The players’ share of revenue has decreased in recent years. Smith wants a “fair” deal, but doesn’t see how that can be accomplished without more financial information from the league. Asked if an 18-game schedule is a deal breaker, Smith explains that anything that jeopardizes players’ health is not in the interest of the NFLPA. Mawae’s closing speech was the best part of the press conference. His frustration is very clear at this point, and he was very blunt in explaining that the players want to play and don’t understand why the NFL won’t give out its financial information if there’s really a problem.